ABL now has VSAT terminals installed for our first two clients. 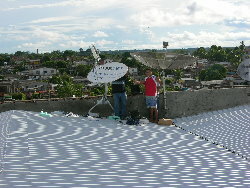 Other than our own system used by our subsidiary, The American CyberCafé of Manaus, Coarí was our first VSAT system installed in the Amazon. This city now has the second largest economy of the state due to the exploration of natural gas and oil recently discovered in that city. 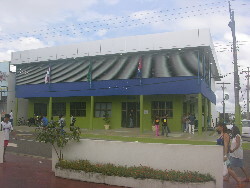 Our client there is the Prefeitura Municipal and they will be using our VSAT system to implement many different social actions in their city. It seems that they are very happy with our services and they are even talking about installing one more system very soon. Our second installation, currently in progress, is in a remote town almost on the border of the state of Amazonas called Benjamin Constant. Our client there is a businessman who plans to establish a CyberCafé and provide some other services to the local community with our system. In addition to these first two systems, we have already signed a contract to install two transportable systems in ferry boats to be used by a subcontractor to Petrobras called Socorro Carvalho which is installing a natural gas pipeline from Coarí to Manaus. These systems will be used to monitor the installation progress by sending reports with photos back to the home office in Manaus. When these systems are operational next week, that will constitute 5 Hughes DirecWay Systems in operation by ABL. It has been slow getting the company up and running and getting our first systems in service, but now that we have accomplished this it is only a matter of time before we become one of South America's leading providers of broadband services. 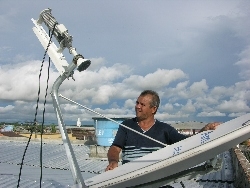 VSAT is our first and our flagship product providing broadband in Amazônia. We are looking forward in the future to providing a full range of broadband, Voice over IP, and Information Technology services throughout all of South America and the Caribbean. ABL and our parent company, Worldwide Harvest LLC, have engaged the services of Castro, Barros, Sobral,Gomes Advogados for our legal support. After more than two years of beating our heads against the wall of the Brazilian bureaucracy we have finally found someone who is able to produce effective and timely results, besides being able to speak excellent English! I offer my personal thanks to José Augusto and Marta of this firm for their excellent help in navigating the endless labyrinth of Brazilian Government! Also my thanks to Boris of Lifestyles Brazil for referring me. If you missed last month's newsletter please click here. I am looking forward to having many exciting new things to announce in next month's newsletter. Stay tuned! 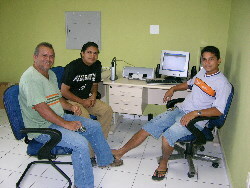 Meanwhile, if you know anyone interested in our services, please have them call our office at (92) 232 5581. Amazônia Banda Larga e Informática Ltda. You have received this e-mail because you are on the ABL Mailing list. To be removed from our mailing list, simply reply to this e-mail with "unsubscribe" in the subject line. © 2005 by Worldwide Harvest LLC d.b.a. Amazônia Banda Larga e Informática Ltda.. All rights reserved.